ZipZone Canopy Tours Reopens for the Season As the temperatures begin to rise, many Ohioans are excited to enjoy the great outdoors again. 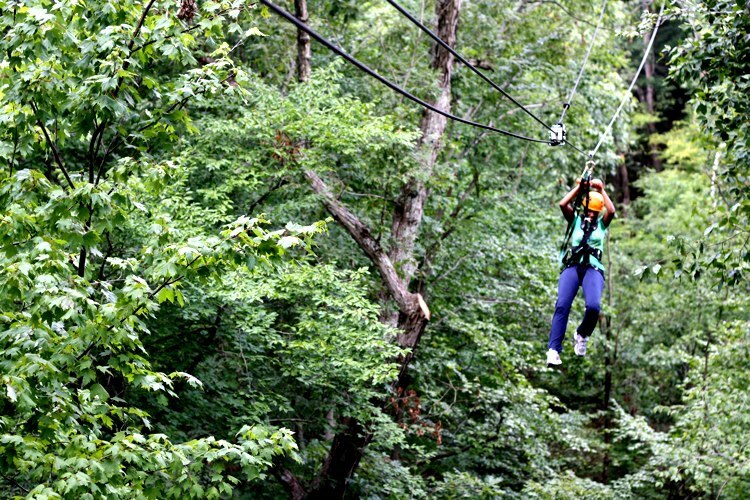 And what better way to experience Mother Nature’s beauty than a zip lining tour through the woods of Camp Mary Orton in Worthington? ZipZone Canopy Tours, Columbus’ first zip line adventure company, will open for their fifth season on March 25, 2016. We recently caught up with Lori Pingle, co-owner of ZipZone Canopy Tours, to discuss their upcoming season and to learn about the projects they’ve been working on throughout the winter months. In addition to making some adjustments to their courses (to stay ahead of industry standards), ZipZone is always thinking about ways to enhance the customer experience. This winter, the crew spent time reworking one of their most popular zip lines, adding in more breaks and creating an additional viewing deck. In fact, ZipZone’s conservation efforts extend far beyond their ash tree milling. The team is committed to environmental protection and goes to great lengths to ensure that their zip line courses are always eco-friendly, like creating hiking trails instead of roads, reducing soil compaction and using reclaimed materials whenever possible. So it's no surprise that they're also in the process of completely renovating their offices using upcycled materials. “We’re really excited about the construction of our new offices. We’re expanding our space to create more room for our retail and storage needs, and we're using old shipping containers and other retired materials throughout the construction," Pingle said. If you’ve never visited ZipZone Canopy Tours before, you’re in for a treat. Their professional zip line guides will take you on a hands-free adventure over streams and ravines—and through the woods—while providing you with knowledge and commentary on the vast nature surrounding you. Feed your need for speed on the Zip Rush Tour. Howl at the moon on the Full Moon Tour. Become a bona fide tree hugger on the Forest Discovery Tour. ZipZone caters to a wide range of ages and abilities and is a great place to host your next group gathering (think birthday parties, scout troops or corporate events). They are located on the grounds of Camp Mary Orton at 7925 N. High Street. Best of all, they're happy to report that the pesky construction near their entrance has cleared up and they are once again easy to find. Call 1-855-LETS ZIP to schedule your tour today or visit zipzonetours.com.